Most people think of pork belly as a slow dish, requiring smoking, curing, or hours of braising, said Stephanie Izard in Gather & Graze (Clarkson Potter). “Little do they know you can also just throw that belly straight on the grill”—and have dinner before you know it. I love fruit in savory dishes, using the combination all the time at Girl & the Goat and my other Chicago restaurants. Here, I combine the fruit and pork belly with my own poblano sauce, an herby spin on salsa verde that we call Sauce Green. But use store-bought if you need to, because this kind of cooking should be fun, not stressful. Make marinade by combining first five ingredients in a blender and blending until smooth. Soak pork slices in marinade for 5 minutes. Heat a grill to medium-high. Lightly brush radicchio and peaches with oil and grill just until grill marks form, about 5 minutes. Flip and repeat on other side. Remove from grill. Cool. Grill marinated pork slices for 2 to 3 minutes per side, making sure fat begins to render and caramelize. 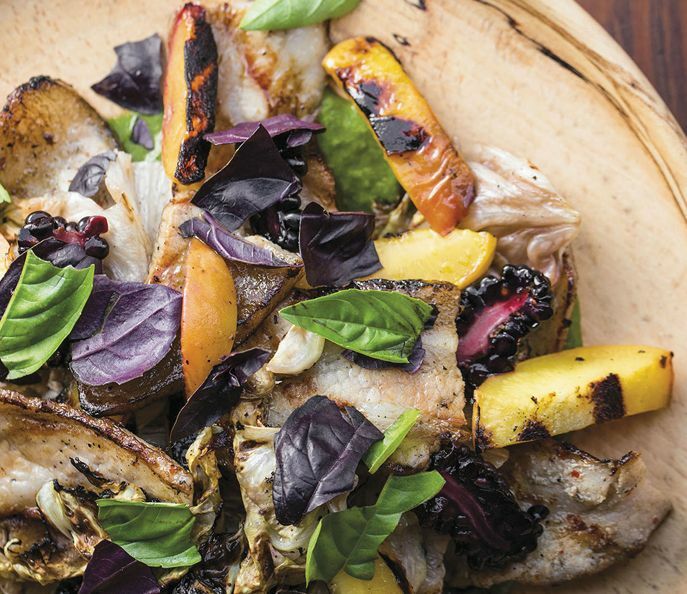 Slice radicchio into medium square pieces, peaches into thick slices, and pork belly into 2-inch-long pieces. Toss together. Spoon a schmear of Sauce Green on a large platter. Place the grilled items over the sauce and top with blackberries and basil. Serves 6 to 8. Coat poblano with a little oil and blister under a hot broiler or over the flame on your stove. Place in a bowl and cover with plastic wrap. Allow to come to room temperature, then peel, core, and seed. Refrigerate flesh until you’re ready to blend the sauce; all ingredients must be cold. Heat ⅓ cup olive oil over medium-high heat in a sauté pan. Add parsley, season with a pinch of salt, and cook only until wilted. With a fine-mesh strainer, separate parsley from oil; put both in fridge until fully cooled. Roughly chop parsley; add to blender along with poblano, fish sauce, vinegar, and sambal oelek; blend until very smooth. Add rosemary, tarragon, and flavored oil, blending for a few more seconds.